One argument for Android phones in the giant, ongoing war between Android and the iPhone, is its level of customizability. Android fans can tinker with their phones as much as they want, make them do all kinds of things that iPhone users just cannot and just generally tinker around to their heart’s content. One shining example of that ability to change and play with Android is a new app which can be found on Google’s newly named Google Play Store. It goes by the rather unfortunate name of ‘NoMoarPowah!’ and does something that we can’t really understand the point of, but it’s certainly something that Apple’s iOS wouldn’t allow. What NoMoarPowah! does is actually quite interesting. 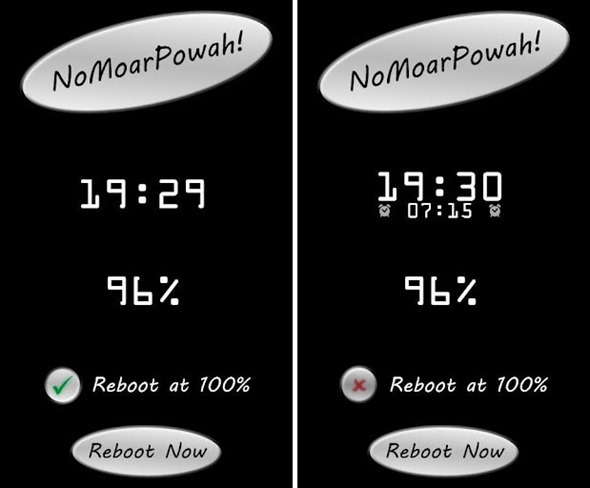 The app actually runs while the phone is not booted into Android, meaning that the device can be charged without the smartphone OS running at the same time. This, presumably, means the phone’s battery can be charged quicker than would normally be possible, which is always a good thing. The app itself has a couple of settings which some may find useful, though we suspect many wouldn’t. For example, NoMoarPowah! 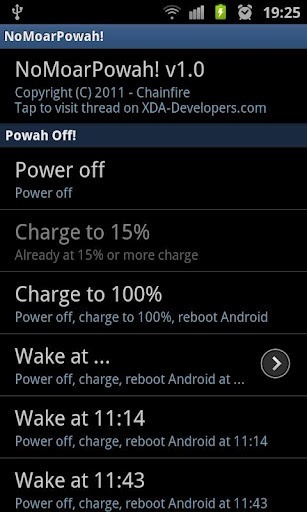 can be set to launch into Android at a predefined battery level. So, for example, Android could be booted once the battery reaches 100%, or perhaps at 15% when the enough power has been replenished to start the main operating system. It’s truly geeky, but that’s rather the point. NoMoarPowah! can even be set to boot into Android before an alarm is set to go off, meaning you won’t miss that morning wakeup call even if Android isn’t running just before it is due to go off. That’s actually rather clever, and hats off to the developer for that. What NoMoarPowah! does is epitomize the world of Android. It offers something that the stock OS doesn’t, and it’s possibly even something that the vast majority of users won’t want or need. If you do, though, then NoMoarPowah! offers you that option, and it doesn’t cost you a penny. The downside? NoMoarPowah! only works on selected Samsung devices which are rooted for now, which is a bit of a pain if you’re not a Samsung owner. But hey, you can’t have everything!